This year, the United States has been hit with a devastating flu season. As of March 17th, the Centers for Disease Control and Prevention (CDC) recorded over 200,000 confirmed cases of influenza and 133 pediatric deaths, which is more than double the number from last year. But why, in a world that has eradicated smallpox and halted the spread of polio, must we fear the flu year after year? The influenza virus causes the disease we call the flu, and three types of the virus can infect humans: A, B, and C. Type A and Type B both cause traditional flu-like symptoms such as runny nose, aches, and fever. These infections can be a major threat to public health during annual regional increases in the flu, known as an epidemic (or, colloquially, as the flu season). Type A has also caused worldwide pandemics, such as the recent “swine flu” pandemic of 2009. In contrast, Type C typically does not cause severe symptoms in humans, so it is of lesser concern to the medical community (Table 1). Type A and Type B influenza viruses are further characterized by their surface proteins: hemagglutanin (H) and neuraminidase (N) (Fig. 1). 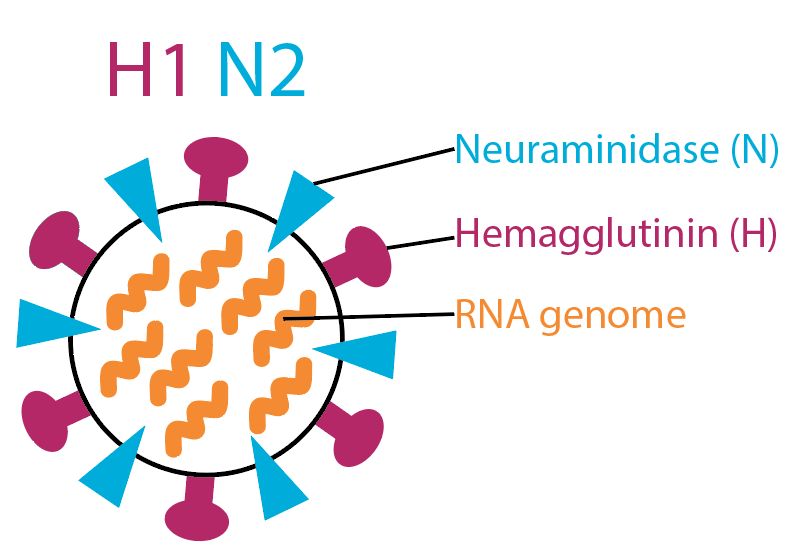 Each influenza virus has one type of H and one type of N. For Type A flu, we know of at least 18 versions of H and 11 versions of N. Variations of Type A flu are named according to the specific types of H and N proteins they have, such as H1N1 or H3N2. While there are nearly 200 potential H and N combinations, only a few exist in nature. In fact, type B influenza has only two mixtures of H and N, Yamagata and Victoria, named by the location in which they originated. Figure 1: Structure of the influenza virus (image not to scale). The influenza virus is a microscopic particle (about 1/1,000th the width of a human hair) coated in the surface proteins hemagglutinin (H, pink) and neuraminidase (N, blue). The virus’ genetic information is contained in 8 segments of a molecule called RNA (RNA genome, orange). How does the influenza vaccine work? In the United States, the most common influenza vaccine is the Trivalent Inactivated Influenza Vaccine (TIV). This vaccine, often just called “the flu shot,” contains inactive influenza virus that looks like the real influenza virus but is missing components that make it infectious. By exposing our immune systems to safe flu look-a-likes, our bodies are able to build a repertoire of molecules called antibodies that recognize the virus and (hopefully) prevent infection. Our antibodies mainly recognize the H and N proteins, which help the virus enter healthy cells and break out of infected cells, respectively. If antibodies recognize the H protein, they prevent healthy cells from becoming infected; if antibodies recognize the N protein, they prevent sick cells from spreading the virus. In this way, the flu vaccine both protects us from getting sick and reduces the severity of infection. The American TIV vaccine always contains three variants of inactivated influenza: two Type A variants and one Type B variant. For 2017-2018, the vaccine contained inactivated forms of a Type A H1N1, a Type A H3N2, and a Type B Victoria. To determine which strains get included in the vaccine each year, the CDC and other agencies around the world are guided by the World Health Organization (WHO), which studies influenza infections across the globe. These data can be used to predict the variants that will continue to circulate into the next flu season, which dictates the contents of the next batch of vaccines. Why isn’t the flu vaccine 100% effective? The WHO predictions come out in February, well before the start of the flu season in October, to allow ample time for the vaccine to be manufactured and distributed. During that period, the viral H and N proteins can change dramatically. One-way Type A and Type B variants change, or evolve, is through a messy copying process. Just as you make typos when you type on your phone, the machinery that copies genetic information sometimes makes errors. Healthy human cells fix these errors with a proofreading step (like autocorrect). The copying machinery in influenza, however, cannot proofread, so accumulations of errors result in gradual changes to the H and N proteins across multiple generations of the virus. The appearance of the virus becomes slightly altered as its H and N proteins change, sometimes to the point where the human immune system no longer recognizes it. These gradual changes are known as antigen drift (Fig. 2). Figure 2: Antigen drift. The error-prone viral copying machinery makes errors while copying the viral genome. These small errors can result in a small change to the H or N proteins (in this case, represented by a red asterisk and the altered shape of the H protein), which can render it invisible to human (host) antibodies. Type A flu also has another weapon to quickly change its appearance and evade our immune system. The influenza genetic material is made up of eight pieces (or “segments”). In a process known as antigen shift (Fig. 3), Type A virus strains can swap entire segments if two different strains infect the same cell at the same time. This results in a completely new combination of H and N proteins that have not yet been seen by the human immune system. Figure 3: Antigen shift. Segments of the viral genome (yellow and green wavy lines) can be exchanged in a single host cell to make viruses that contain new combinations of H and N proteins. In this case, H1N2 and H3N1 viruses infect the same host cell, resulting in the potential production of the original H1N2 and H3N1 strains or the new forms H1N1 and H3N2. Towards a universal flu vaccine? Because the flu shot must change each year to respond to the changes in the influenza virus itself, scientists at the National Institute of Allergy and Infectious Disease and around the world are working to design a universal vaccine that could recognize all influenza variants. One major problem with the current flu vaccine is the way it’s manufactured. Currently, most vaccines are made in eggs (which is why you shouldn’t get the flu shot if you have an egg allergy). But when influenza is grown in eggs, the virus can mutate or change slightly to grow more effectively in that environment via a process known as egg-adaptation. When this happens, the flu vaccine is less effective because the antibodies developed to recognize the egg-adapted virus do not recognize the actual infectious flu variants circulating in the human population. This mismatch phenomenon is happening this year: the H3N2 variant in this year’s flu vaccine has undergone egg-adaptation, yielding a vaccine that is only 30-40% effective. This has been especially problematic because nearly 75% of all reported cases have been of the H3N2 variety. To prevent this from happening in future vaccines, new human cell-based technologies have been developed and approved by the Food and Drug Administration (FDA). These cell-based vaccines have supplemented egg-based vaccines this past year and research suggests they might even be more effective. There are also attempts to completely re-think the target of the flu vaccine. Research groups around the world are trying to find surface proteins on the influenza virus that do not change as frequently as the H and N proteins. New targets include the stable hemagglutinin stem protein—which was independently discovered by scientists in the US and the Netherlands—and the M2 extracellular matrix protein. Initial experiments in mice and in early phases of several clinical trials suggest that both of these targets may be tractable. More research is needed to understand the effectiveness of these alternative strategies and the manner(s) in which the virus might become resistant to them. However, while the world waits for a new and improved flu vaccine we must all take caution during the flu season. Do as your doctor says: wash your hands, stay home if you are sick, and get the flu shot. Catherine Weiner is a fourth-year Ph.D. student in the Department of Molecular and Cellular Biology and the Department of Genetics at Harvard University. Could you please elaborate on the egg allergy situation? I thought the current guidelines consider the vaccine safe for those with egg allergies?